This stand is compatible with Apple Watch Series 3/Series 2 / Series 1 workable for both 38mm and 42mm, iPhone8/7S/7S Plus/7/7 Plus/SE/6/6 Plus, Apple Pencil, Siri Remote etc and suitable for iphone case of diferent thickness. Two removable silicones are included, the thin one is for your phone with case, thick one for your phone without case. 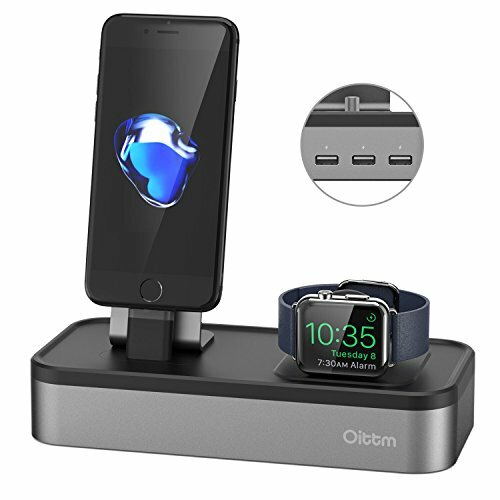 Stylish flat deck design, one stand for Apple users to address some inconvenient in charging, easy to place, you could charge your device when you are rest, only need to stand it on your nightstand after connected the power supply. The 3 USB ports give an output of 2.4A each; charging faster than your traditional 1A adapter, with half the wait time of charging. This powerful stand supports a total charging output of 7A, each port detects your device automatically to avoid over-current,overheating and short circuit, charging securely and confidently. A Simple cable management designed that helps you hide the mess cable to keep your desk neat. Note: To avoid the scratch of your phone, pls carefully and slightly when you install the aluminum bracket of back and place the phone. [Cable Management Design]: Built-in cord organizing space can help you manage your long cable, make your desk neat and less clutter. The cable must be placed neatly, or you can't close the lid. Pls follow the installation instructions and pics of "Enhance Brand Content" page to install this stand. [Lifetime Warranty and Use safety]: AC adapter(UL certification has passed) includedThe cable must be placed neatly, or you can't close the lid. Whe you remove your phone after charged full, pls kindly hold the silicone part with your one hand, other hand hold your phone to leave.